It’s Sunday night, and Avalanche defenseman Nick Holden is standing in front of his stall deep inside Pepsi Center. 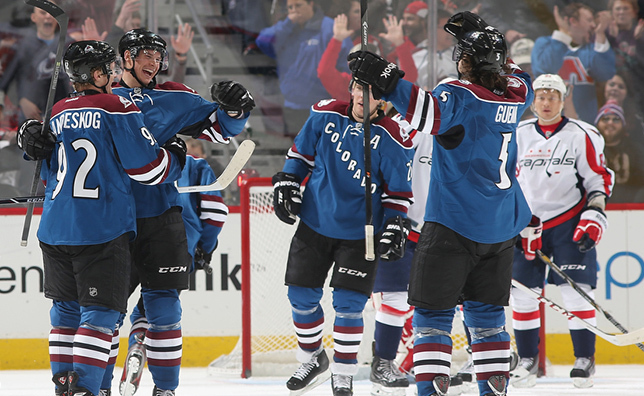 It’s been about an hour since he scored his first NHL goal and helped the Avs to another victory. He can’t stop smiling as he talks to reporters all of a sudden very interested in this 6-4, 200-pound defenseman. Outside the locker room, the arena is emptying as excited Colorado hockey fans make their way out into the November Denver night. They’re thrilled with the team’s 14-2 record in the past six weeks and excited to see how the next six months play out. Among those fans is Holden’s wife, Angela, and his son, Parker, who, like Holden, are pretty pleased with how things have gone the past few weeks. A reporter asks Holden to describe his emotions after he saw his puck shot fly past the outstretched glove of Capitals goalie Braden Holtby. Another reporter asks him to describe the shot. The one that put the Avalanche ahead 2-1 just 28 seconds after Washington had tied the game at 1-1. Holden’s score would ultimately be the game winner, making him the 10th player this season to score a game winner for Colorado. “When you get scored on it’s huge to have a big shift the next shift,” Holden says. “So it was good to get back on that line and score a goal and get the momentum right back into our favor. That goal is what Holden is talking about and what everyone in the room is interested in, but it seems like he's thinking about something different. Someone else asks Holden to put this whole thing into words—the goal; playing in the NHL; being part of a team that’s doing so well so early in the season—and he opens up a bit. He can’t believe he is where is. “I’m always pretty happy and try and stay positive,” Holden says, clutching the puck from his first NHL score, which figures to be the central to many stories he’ll share with his son for a long, long time. “It’s nice that I’m getting an opportunity to get to help contribute to this team a little bit more than just practice with them. Holden’s been working toward this moment for a long time, spending countless hours as a kid practicing his skills and skating in St. Albert, Alberta, Canada. He played six seasons in the American Hockey League, with the Columbus Blue Jackets’ Syracuse (N.Y.) Crunch and later the Springfield (Mass.) Falcons, and that meant a lot of hours spent on buses. A lot of hours spent thinking about getting off that bus and playing in the NHL. He first got his chance with the Columbus in the 2010-11 season and played five games—just a little taste—before spending two more years in Springfield. Holden got ice time in two more games with the Blue Jackets last season before signing with Colorado as a free agent this past July. He didn’t have much of an NHL track record when the Avs opened their training camp in late August, so Holden seemed like a longshot to make the squad. He ultimately did, but he was a healthy scratch the first 11 games of the season. Basically, he wasn’t sent back to the minors, but his only real contributions to the Avalanche were in practice. Not many fans would have been able to pick him out if they passed by him at the mall or stood behind him at the movies. Then, when Jamie McGinn, a forward, suffered a minor injury in late October, it was Holden’s name that got called by Avs coach Patrick Roy. The plan called for using Holden in the offensive zone that week against Dallas after he spent his entire career learning the defensive aspects of hockey. It wasn’t an ideal situation for making a first in-game impression, but Holden wasn’t going to let the opportunity pass him by. He attacked the game with a mindset of just trying to keep it simple and to just “try and hit somebody.” It resulted in 4:39 of ice time in a game Colorado would eventually win in overtime. 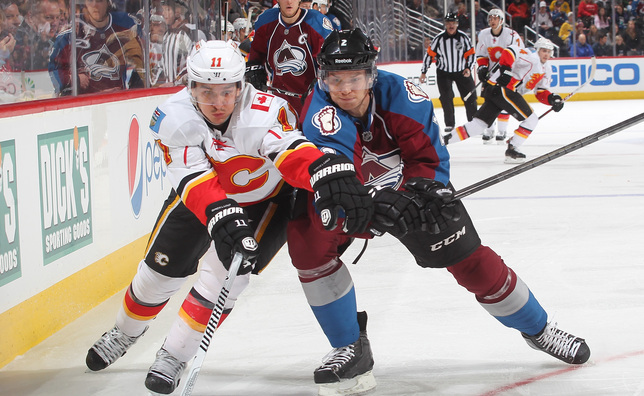 After two more scratches, against Montreal and Nashville, Holden got back on the ice and back on the defensive side in Colorado’s wins against Calgary and Washington. He played 15:56 against the Flames and 18:07 against the Caps. “It’s a dream to play in the NHL, and to get an opportunity with Colorado, like they’ve given me, to score my first goal is unbelievable,” Holden says. ““When I signed in the summer here, I just wanted to help the team in whatever way I can and, obviously, make the team out of camp,” I did that, so now it’s exciting that I get an opportunity be on the ice and actually contribute a little bit. With defenseman Ryan Wilson (back) still scheduled out for Tuesday night’s game vs. Carolina, Holden figures to get another opportunity to show what he can do and leave another strong impression on Avalanche decision-makers. When he was sitting on those AHL bus rides, between Syracuse and Binghamton (N.Y.) or from Albany (N.Y) to Worcester (Mass. ), he thought about a lot of things, and that includes his friends and family, who were all watching Sunday when he gave Colorado a lead it wouldn’t lose. Most were watching on TV, but his wife and son were right there with him, watching in person as Holden’s dream was realized. It’s probably a good bet that Holden counts the days he met Angela and Parker as two of the best days of his life. Scoring that goal likely added Sunday, Nov. 10, to that list, too. “I’m sure I’ve got lots of friends watching,” Holden said. “My parents are watching, my brother my sister. My wife and my son just got down last weekend, so it’s obviously special to have them here to see this happen.